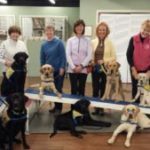 In addition to operating our own service dog program, CPT also operates the Puppy Raiser Classes for the Atlanta Chapter of Canine Companions for Independence (CCI). CCI is the nation’s largest and most respected nonprofit service dog organization. CCI breeds puppies from specially selected sires and dams. The breeding dogs are either Golden Retrievers, Labrador Retrievers, or Lab/Golden mixes of outstanding temperament for service dog applications. The resultant puppies are first or second generation Lab/Golden crosses. At a breeding center in Santa Rosa or at a family home CCI maintains the dam and litter until the pups reach 8 weeks of age. Then, at 8 weeks the pups switch to the care of volunteer puppy raisers, who will maintain a pup until the dog reaches approximately 18 months of age, whereby the animal converts to the adult training stage administered by CCI’s professional service dog trainers at one of six CCI training locations throughout the USA. The adult training period is 6 months, during which CCI determines whether the animal graduates as a service dog or is released to the puppy raiser or an adopter. A display of out-of-context anxiety, aggression, or excitability disqualifies a dog from working as a public-access service dog. Puppy raisers must agree at their expense to feed the pups and provide them veterinary care. They must also agree to consistently train the puppy at their expense for about 14 months- until the time the puppy is transferred to adult training. The CCI Atlanta Chapter recommends CPT for its Puppy Raisers. CPT has designed special discounted classes for the CCI volunteers. The classes include basic through intermediate obedience, general manners, environmental socialization, and sensory stimulation, while adhering to all CCI corporate puppy raiser guidelines. Unlike a typical basic obedience class, the Puppy Raiser Class may include agility, to enhance sensory stimulation, body awareness, and confidence, group outings to parks, malls, and urban areas, to enhance environmental socialization and desensitization, and rides on mass transit. The Class intermittently includes high-level distractions that we don’t integrate into standard obedience classes. 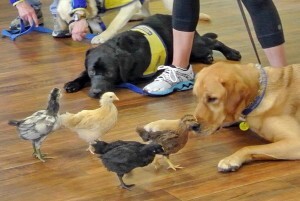 For instance, to provide challenges for the dogs we have had cats and chickens attend our CCI Puppy Raiser Class. Service dogs must remain calm, composed, confident, and cooperative, regardless of the environment or circumstance. Therefore, CPT uniquely designed the CCI Puppy Raiser Class to foster the accomplishment of those goals. 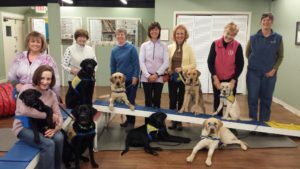 CCI Puppy Raiser Class- Jan 23, 2016.